F. Gary Gray’s blimp rose alongside Ice Cube. In 1992, he directed Cube’s “It Was a Good Day” before directing the rapper-turned-actor’s cinematic debut Friday. He went on to carve a real name for himself at a ripe young age directing music videos for other black artists including Ice Cube homeboy and N.W.A. group member Dr. Dre, Tupac, Jay-Z and hip-hop supergroups Cypress Hill, TLC and Outkast. In 2003, Gray blew up the box office with a retelling of The Italian Job while his last film, Law Abiding Citizen, more blew up in his face. 6 years on, Gray has returned to Hollywood to aid in telling the tale of hip-hop superstar group N.W.A. (we’ll go by the innocent ignorance of Jerry Heller and pretend that’s the abbreviation for “No Whites Allowed) with Straight Outta Compton. In telling the dizzying tale of that consummately influential group, Gray has laid bare the inception of hip hop; he’s honed in on the destitute ground zero of a billion dollar industry (hip-hop music generates approximately $10 billion every year); and, most importantly, he’s opened the book on all the infighting and fractious implosions of N.W.A.’s relationships gone sour. It’s an exhaustive account (what with 147 minutes to play with) but one that hits the high notes and lows with real piss and vinegar, dragging us to a foregone conclusion that wallops like it’s Lil Bunny Foo Foo unleashed upon the urban jungle. Gray’s film opens on Eazy-Motherf*cking-E (played effectively by Jason Mitchell). 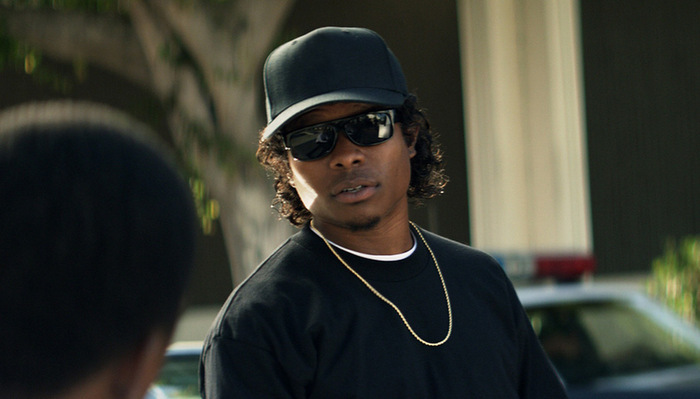 Caught up in a drug deal gone painfully wrong, Eazy-E proves not one to balk at difficult situations. With a cocked pistol four inches and closing from his dome piece, he threatens his would-be assailant with the news that he’s got his boys parked on the gunman’s momma’s street, AKs aimed at her floral shutters. Sweat beads from both foreheads as the strapped man chews on this knowledge slowly. Wham, a battering-ram-as-tank pummels into the scene, tossing pistol man’s armed ho like a Raggedy Ann. The crack den tension interrupted by police raid makes for fitting thematic conflict (and showcases a scrambling getaway that threatens to become as high-strung as Matthew McCougnahey’s lauded True Detective escape.) 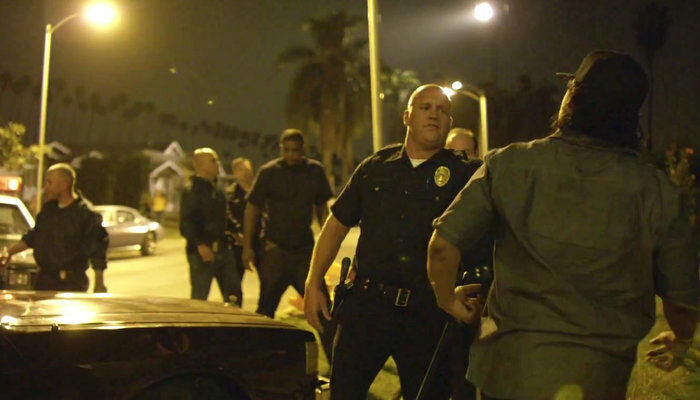 In one fell swoop, Gary has set up the two main points of contention that exist in Straight Outta Compton – gross and negligent overuse of police force and Eazy-E’s unflinching gumption (and ultimately resourcefulness) in the face of turmoil. Always the true gangster of the group, Eazy-E is also the (easily corrupted) heart and soul of what would become N.W.A. As is always the case, his hubris leads to his downfall, though the circumstances of the gangster rapper’s meteoric rise and precipitous fall are singularly tragic. There to paint a portrait and not to deify, Gray captures the commendable in with the crummy, giving room to the political absurdity and cultural congress of the time period while underlining how brotherhood can be spoiled in divvying up the treasure chest’s loot. 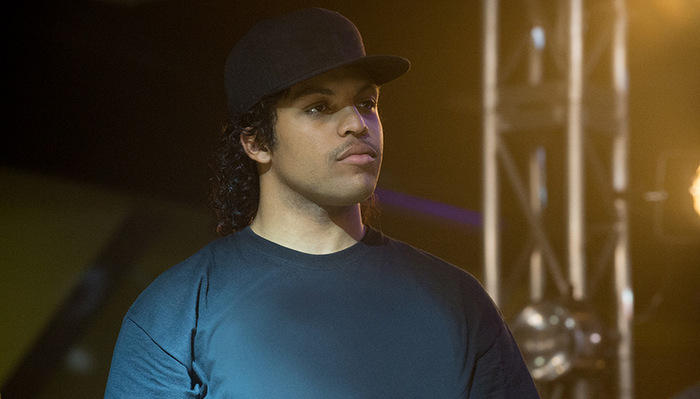 Gray shifts focus to Ice Cube (played capably by Ice Cube’s real life child O’Shea Jackson Jr. in his film debut), who will become something of the film’s black sheep. An artist at heart and perhaps the group’s greatest wordsmith, Ice Cube is much less trusting than some of his compatriots when it comes to signing contracts with the devil. The devil in this situation is Jerry Heller, a scab of a manager with hair as lily white as his skin. Reaping the harvest of their collective talent, Heller (Paul Giammatti) is the film’s duplicitous heavy; slobbering and manipulative though he may be, he’s a troublingly human character; his great vice arriving in the form of unchecked greed and coy deceipt. Somewhat oddly, this is Giamatti’s second performance in 2015 as a deceptious manager to a famously troubled star (the other being in Brian Wilson biopic Love & Mercy). 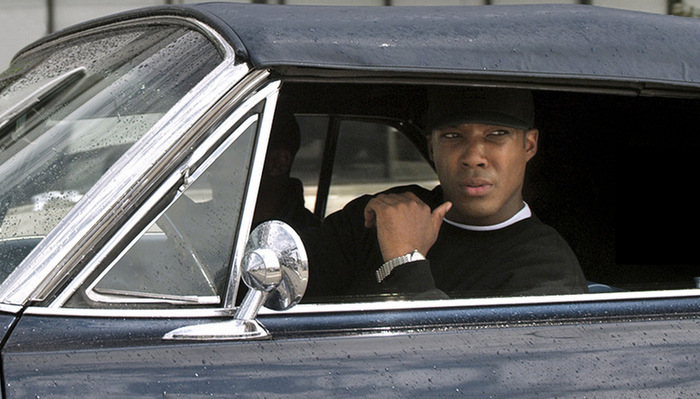 Dr. Dre (Corey Hawkins) is introduced as the level-headed “musician” of the group and neighbor to Cube, sprawled out in a pile of records, sipping down beats and tapping fingers to swift keyboard runs. Before Dre was worth north of 700 million dollars, he was a kid in the hood refusing to live inside the tight confines of a cubicle. Here, Yeezus would interrupt to say something about new slaves. Cutting their teeth at the club, Dre and Cube pair up with Eazy E, MC Ren (Aldis Hodge) and Dj Yella (Neil Brown Jr.) – the later two playing disappointingly secondary roles to the more well-known trio front and center. Dre muses about trying to put together a label and before you know it, the five of them are crowded in a studio blasting out songs that swarm to the top of the city’s most requested lists. A whirlwind of fame, money, police threats and women inebriate the group, laying the groundwork for their taking their groundbreaking act to the next level. Even as they experience success, the group is still targeted by racist cops, who hone in on their gangster fashion like pigs to truffles. N.W.A.’s counter-culture anthem “F*ck the Police” is given a wonderful little origin story that’s both depressingly poignant to our current times and foreboding of the further riotous battles to come. Gray hedges the Rodney King trial in amongst the later proceedings of the film, giving political context to the group (and culture’s) cataclysmic shiftings. It’s all part of a masterplan to give life and rhythm to a time and a place though all these little parts crammed into such a tight space does end up making certain events feel cramped. As bad deals and acrid contracts turn relationships bitter, we get a glimpse of the true magnitude of the N.W.A. empire. Though their eventual disruption and fracture marked the death of unrealized potential, it also laid the groundwork for an explosion of musical innovation. The roots of this group are spread so vastly, are buried so deep and are so far reaching that it’s hard to pinpoint a hip-hop artist since that has not been directly effected by the members of N.W.A. 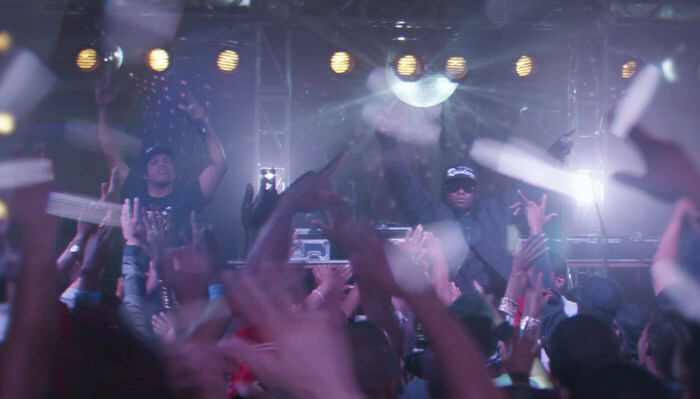 The film’s credits roll through a certifiable army of rappers crediting the members of N.W.A. for their success. But it all comes back to Eazy E, he that could not spit rhyme during his first recording session, he who was but a money front turned into an accidental icon, he who could not see that his strongest asset lay in the fabric of the brotherhood he’d woven with Cube and Dre. With their withdrawal, he was a frayed star; an idol laid to waste by entropy and greed and sickness. Anyone with internet access can discover for themselves how things ended for Eazy E but Gray manages to make the wounds feel fresh and sing out like from the battering of a thousand meaty fists. I sweat profusely, verging on tears, when Eazy’s fate was revealed to him. Mitchell soars in the scene. It’s blistering cinema that operates like a beat down because we’ve been alongside Eazy for his triumphs and his failings for the last two and a half hours. We’ve fought with him, bleed with him, cheered with him. And like N.W.A., we must too die with him. CONCLUSION: Though hip-hop biopics have largely been missed opportunities, Straight Outta Compton tells the story of N.W.A. with true purpose. An able cast, sweeping narrative and poignant directing from F. Gary Gray make for a powerfully important experience and one that is remarkably timely. This entry was posted in Out in Theaters and tagged Aldis Hodge, Corey Hawkins, Dr. Dre, F. Gary Gray, Ice Cube, Jason Mitchell, N.W.A., Neil Brown Jr., O’Shea Jackson Jr., Out in Theaters, Paul Giammatti, Reviews, Straight Outta Compton. Bookmark the permalink.